Spruce up your style and enjoy the luxurious convenience of this hOmeLabs Beverage Refrigerator and Cooler. The perfect solution if you don't have room in your fridge for variety of entertainment beverages for your party. Equipped with high quality durable materials and rack accessories with an elegant decorative finish that greatly matches and lights up any retro or modern kitchen decor. 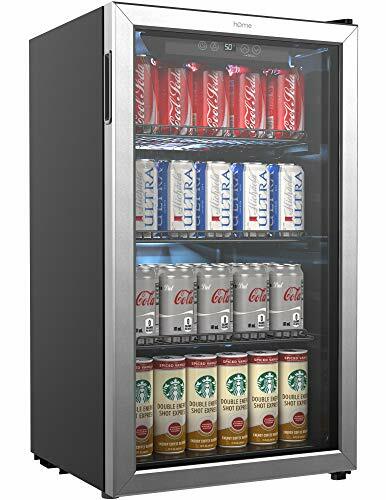 This 3.2 cubic feet electric beverage cooler in silver and black finish is designed with a large capacity interior to conveniently hold your beers and wine bottle collection. With a sturdy base that stands perfectly on the floor and fits easily under a bar or kitchen counter, or in any office space. And smartly constructed of advanced one touch user friendly cooling controls. PRODUCT SPECS: Voltage: 115V (AC), 60Hz, 75W input power, 92W rated power. EXTERNAL SIZE: 19.3 W x 33.2 H x 17.3 D inch (49 W x 84 H x 44 D centimeter). INTERNAL SIZE: 16 W x 29 H x 12 D inches (40.6 W x 73.6 H x 30.5 D centimeters). Capacity: 120 standard size cans, or 60 wine bottles. Materials: Stainless Steel frame, high quality Glass door. Color: Silver and Black exterior. Compressor based with Adjustable temp control and Auto defrost function. Features 3 removable shelves, air convection fan, LED digital display and adjustable feet. SAFETY AND CARE: Unplug the cooler before cleaning. Wipe the door seal with smooth damp cloth. Remove the shelves and wipe with smooth and clean cloth the interior of cooler. Reconnect when the cooler is clean and dry. For full care instructions and safety warnings, always refer to hOmeLabs box and manual. If you have any questions about this product by hOmeLabs, contact us by completing and submitting the form below. If you are looking for a specif part number, please include it with your message. Ello Ogden BPA-Free Ceramic Travel Mug with Lid, Denim, 16 Oz.